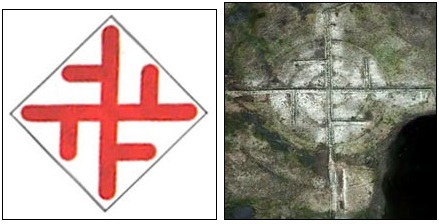 WWII Roswell AAF precision bombing target did use Slavic central pattern surrounded by other patterns. Some targets were more free of impact craters because RAAF sometimes dropped bags of water or sand instead of explosives. Source: NM Bombing Ranges and Targets. 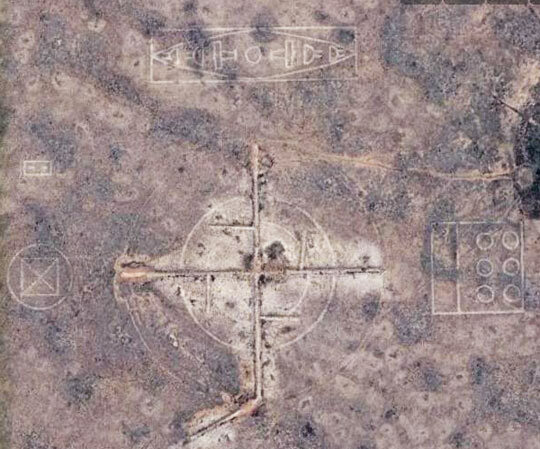 Ancient Slavic symbol of eternity and constant cycle between Life and Death (left) does match the desert patterns (right) discovered on Google Earth east and northeast of Roswell, New Mexico. Source: Slavorum.org.